The El Portal Theatre l The Male Intellect: An Oxymoron? An international comedic phenomenon. 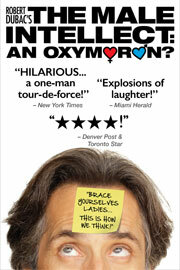 Described by The New York Times as "Hilarious ... a one man tour de force!" it is hands down one of the funniest solo shows you will ever see. On a quest to answer the age old question, "What do women want?" Robert Dubac seamlessly transforms himself into five hysterical boneheads who each offer sidesplitting advice on how to best straddle the gender gap - all while drinking a beer. Men and women from eighteen to eighty laugh non-stop as THE MALE INTELLECT nudges the battle of the sexes towards a humorous detente with everyone elbowing each other in the end with loving laughter and recognition.